If the law has any sanctity, the Congress party’s candidate for Saharanpur, Imran Masood, who has now been arrested, ought to be speedily prosecuted for threatening to chop BJP prime ministerial hopeful Narendra Modi into pieces. And if politics was about morality, the Congress would quickly rid itself of this rabble-rousing oik and field someone else in his place, rather than merely condemning him and canceling a rally in his support where Rahul Gandhi was to speak. But then we already know that in India today, the law has little sanctity and politics no room for morality of any kind. Consider Exhibit No. 1, Varun Gandhi. In 2009, video recordings emerged of the callow BJP leader boasting before a crowd in Pilibhit, Uttar Pradesh that his were not ordinary hands. “These are the hands of the ‘kamal’ ,” he roared, referring to the party’s poll symbol, adding, “And these would chop off the heads of Muslims after the elections.” To make matters worse, he used an incendiary expletive to describe the community. Varun was arrested, charged with inciting violence under Section 153 of the Indian Penal Code, and released on bail after three weeks. But despite the existence of clear video evidence, the trial court acquitted him last year after he refused to provide a voice sample (something he should have been compelled to do), all witnesses turned hostile and the prosecution too failed to properly press its case. The BJP then went on to elevate Varun as a general secretary of the party. The UP government has since gone on appeal, especially in the light of a sting operation conducted by Tehelka in which many witnesses were captured on camera admitted turning hostile because they had been threatened by local police and politicians. The sting generated damning evidence that much of the leg work to produce the acquittal was done by a Muslim politician from theSamajwadi Party, Riyaz Ahmed, as ‘payback’ for Varun Gandhi’s assistance in helping him to get elected as an MLA. Ahmed is now a minister in the UP government. There is much that Imran Masood and Varun Gandhi share with each other, apart from their fascination with “chopping”. Both are braggarts, and also cowards. Both men are highly irresponsible and should never be trusted with power or responsibility of any kind, let alone elected office. Saharanpur, where Masood spewed venom, is barely an hour’s drive from Muzaffarnagar, epicenter of the recent incidents of communal violence that shook western UP. Pilibhit district is not communally sensitive but it has a mixed population that would have been placed at risk by Varun’s fiery threats.But despite these very obvious transgressions, their parties consider them political assets because they cater quite effectively to their respective vote banks. Varun lacks sophistication and finesse but panders nicely to the insecurity and false sense of grievance that the BJP has tried to cultivate among Hindus in UP. Masood is useful for the Congress because ‘leaders’ like him help to provide a false sense of security to impoverished Muslims and keep them in the thrall of identity politics – something the party needs in order to run its political protection racket and get away with doing little else to benefit the community. Of course, the true utility of leaders like Masood and Varun rests on the premise that the violent and poisonous rhetoric they employ remains confined to the nukkad or mohalla, gaon or galli and does not spread to the wider body politic where its toxicity cannot easily be digested and may even cause harm. At the national level, for example, the Congress will mouth rhetoric about “justice”, while the BJP prefers to employ meta-narratives like “equality” or “appeasement”. But the message can and does become base at the base. In 2007, for example, the BJP quietly put into circulation a hate-filled CD called ‘Bharat ki Pukar’ for the UP assembly elections. When the CD emerged in the national media, the party promptly and predictably disowned it. Or consider the rhetoric of Narendra Modi. In the micro-level fight for Gujarat in 2002, he openly taunted the Chief ElectionCommisioner (who had earned his ire by delaying the elections) for being a non-Hindu (‘James—Michael–Lyngdoh’ he would say with great emphasis on the Christian names). In the early stages of his prime ministerial campaign, Modi used some subliminal messaging (the ‘burqa of secularism’) but has stuck to the safer theme of ‘development and governance’ as the Lok Sabha election draws nearer. Coming back to Varun Gandhi and Imran Masood, there is one more belief that they share in common: the certainty that the law will never catch up with them, even if the state administration ends up in the hands of a rival party. Consider Exhibit No. 2, the case of Haji Yaqub Qureshi, who, as a minister in Mayawati’s government in 2006, had publicly declared he would pay Rs 51 crore to anyone who would murder the Danish cartoonists who had insulted Prophet Mohammad. Despite this incitement to violence, nothing happened to him . “The announcement had been made taking into account the feelings of the people… There is no offence to make such an announcement about a person living in a distant foreign country,” Principal secretary (Home) Alok Sinha told reporters. “In a democracy such announcements are made in a normal way… It cannot be said to be a law and order issue”. Fortunately for democracy, though, the Muslims of his constituency saw Qureshi for what he really was and ensured his defeat in the 2007 assembly elections. Qureshi, incidentally, is now the BSP’s candidate for the Lok Sabha seat of Moradabad. Political parties like the BJP and Congress, SP and BSP need their own rabble rousers to mobilise their vote banks. But they also need their opponents to use the same methods because this allows them to validate the premise of their vote bank politics and point fingers at each other. 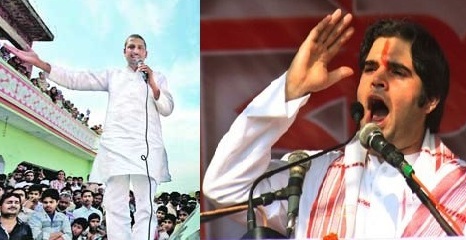 In this political ecosystem, Imran Masood and Varun Gandhi belong to the same dangerous species, a genus that is at once ferocious but also sly and gutless.When confronted with the ugly roar of their words, they slink away quietly. Only to come back when conditions are more favourable. There is one more paradox about Indian democracy that we all need to ponder over. That while the Masoods and Varuns, or the Pravin Togadias and Akbaruddin Owaisis, can continue to spew venom with impunity, ordinary citizens are increasingly being targeted by the police for the exercise of ordinary speech. Consider Exhibit 3, the case of Shaheen Dhada and Renu Srinivasan, the young women from Palghar, Maharashtra, who were arrested in November 2012 under Sections 295 (A) (deliberate and malicious acts, intended to outrage religious feelings or any class by insulting its religion or religious beliefs) and 505(2) (statements creating or promoting enmity, hatred or ill-will between classes) of the IPC for posting (and liking) a message on Facebook which said Mumbai had shut down out of fear, and not respect, for the late Shiv Sena leder Bal Thackeray. There was, of course, a delicious but nasty irony in that case. Thackeray was well known for his toxic speeches against Muslims, Biharis and non-Maharashtrians in general and was one of the few Indian politicians to be banned by the Election Commission from voting and contesting in polls for six years for the corrupt practice of seeking votes in the name of religion. But no government – including that of the Congress – ever had the courage to properly prosecute him for hate speech. Can Imran Masood and Varun Gandhi be blamed then for emulating his style of rhetoric? Varada bhai there is a method to your madness. Whenever you have to comment on a negative of congress, you always quote a similar one from BJP to show after all everyone is the same. But if u have to comment on negatives of BJP you go on them like a ton of bricks. I am sure if you have to comment on Varun’s case you would not have talked about imran at all. I think you meant Akbaruddin Owaisis and not Asaduddin Owaisis! Well, Mr Chaddi, Masood represents a pathology in Indian politics and there are plenty of others who share that sickness. It would be odd not to point that out., surely. Recently following you on NDTV with Mr.Roy. Give you anything you would find a positive from it for congress and a negative for BJP. Would connsider you a true liberal if you wrote a piece criticizing imraan masood without making it equally about varun gandhi as well. dont think only you are smart enough to detect the subliminal subtle messaging. This entry was posted on March 29, 2014 by Siddharth Varadarajan in Indian Politics.